This article submitted by Linda Stelling on 10/13/99. Chuck and Mary Hennen (pictured at right), St. Martin, recently purchased the St. Martin Grocery Store from Jim and Betty Schmidt, St. Martin. The Hennens have changed the name to Hen'n Food and Service. 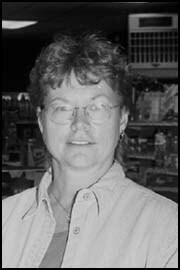 Mary worked at Hot Stuff Pizza at Cenex in Paynesville and did crafts at home. She wanted a new routine and full-time employment. "I found full-time employment," she joked, "the store keeps me busy all day. I'm learning about the grocery store business as I go," she added. Hennen worked with Schmidt for a month, learning the routine of the store, before taking over Oct. 1. "My goal is to keep the store afloat. I enjoy working in a town where I know the people instead of having to drive to St. Cloud to work. "The store is a convenience for the towns people, enabling them to pick up little items when needed." Hennen said the store is a challenge for her and it will broaden her horizons. Her husband Chuck works with Rich Mueller and will help out in the store winter months. The couple have six children, four still living at home. They will be helping out in the store after school and on weekends. "I couldn't have had a better teacher than Betty to teach me the ropes of the business," Hennen said. The store is open 7:30 a.m. to 6:40 p.m. Monday through Saturday and on Sundays, 9:30 to 11:30 a.m.